“Was he bowing to himself when he died?” So begins one of the most daring, unusual, and memorable collections of poetry in translation that I have read in years. This book of ‘remade psalms’ written by ‘a child of September’ and carried into English by one of our best lyric voices, gives us that rare thing: devotional poetry that is as skeptical, self-doubting and struggling as it is glorious in its high-style and aspiration. “Yes, I loved greatness too much…I savored the vulgar tongue,” writes the poet who admits, “then I came to dream of writing / the great prayer of our time” only to step back “I could never have the right to such a voice” and yet, affirm: “I assemble an interior liturgy in this way.” One thinks here of Celan’s “o one, or none, o no one, o you” when one is faced with the poetics of such immediate negation and affirmation, of seeking. Devotional poetry is the hardest to translate and Grotz’s brilliant and very honest introduction offers a rare glimpse into the struggles, the doubts and joys of this process, in a way that is both frank and refreshing—and raises the bar for anyone who attempts to translate, from any language. G.A. Chaves, born in Costa Rica in 1979, is the author of short stories Cuentos etcétera (2004) and poetry collection Vida ajena (2010). Chaves has translated an anthology of poems by Robinson Jeffers and edited the selected poetry of Costa Rica’s Carlos de la Ossa. Jennifer Minniti-Shippey was excited to interview him about contemporary Spanish-language poetry, his work as a translator, and everything in between. Jennifer Minniti-Shippey: In your opinion, who are the most interesting poets writing in Spanish today? What sets them apart and makes them must-read poets? G.A. Chaves: Among the ones I know best, I think that Fabio Morábito (Mexico) and Rafael Courtoisie (Uruguay) are both major poets with very distinctive voices. Morábito has a reportage kind of immediacy to his language, whereas Courtoisie is a ceaselessly experimental virtuoso. I recently discovered the poetry of another Mexican, Luis Felipe Fabre. His poems seem to be capable of making old tricks (like rhyme) useful and fun again. In Spain, I like the variety of Juan Carlos Mestre’s work. He’s densely personal, yet not confessional, and strongly social, though not quite political. He seems to me a modern-day John Donne: everything he sees becomes poetry. 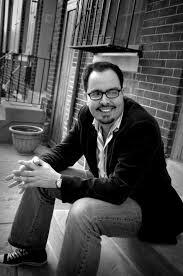 Javier Payeras (Guatemala) is an incredibly inventive poet with an amazing eye for dramatic details. There are two Costa Rican poets who I think we will keep reading for many years: Silvia Piranesi (a tropical Samuel Beckett, with a vengeance) and Klaus Steinmetz (a poet who understands that intelligence is not the negation of intense feeling). When I read Steinmetz and Piranesi I have to conclude that, yes, there are still things that can only be said through poetry, and that the medium of verse is not only valid but also very necessary. There are two other Costa Rican poets that make me feel that the place I inhabit is worth writing about: Luis Chaves (no relation) and Alfredo Trejos. Their poems are as familiar to me as the city I live in. JMS: What European poets are best known or loved by their Spanish language counterparts? And what American poets? GC: I feel like all I can do here is name-dropping. While all the major names (Ginsberg, Ashbery, Celan, Szymborska, Enzensberger, Pavese, Bonnefoy, Transtromer) are well-known, I think people look for stuff everywhere and their writing is proof of that. I think that not many people know Don Paterson and Jürgen Becker, which is a shame. But maybe I’m just hanging out in the wrong neighborhood. JMS: Translators who work with Romance languages often wrestle with capturing the musicality of those languages in English, with its more limited range of rhyme. When you translate poems from English to Spanish, what is your process? Which poets have been “easiest” to translate into Spanish? And which have been difficult? GC: I think this is a mistake. We all despair too quickly when our target languages can’t quite reproduce the fixtures of the original and end up thinking that our native languages are somewhat inept. The reason why Spanish, for example, gives the impression of being rhyme-rich is because it is completely regular in its five vowel sounds. An “o” will always rhyme with an “o.” That’s why “rezo” and “mozo” can pass as rhymes. But I think every writer with a good sense of prosody will tell you that this is a limitation. English is so maddeningly irregular that it could rhyme the Spanish “rezo” with the English “wrestle.” More than a limitation, I think that’s a blessing. So far, Stanley Crawford’s novel Log of the SS. The Mrs. Unguentine is the hardest translation I’ve done. It’s only a hundred pages long, but it took two translators to do it. I was functioning mostly as a consultant to Andrea Mickus, the other translator on the project, but it was a very demanding and exhausting job all the same. JMS: How does working as a translator influence your own poetry? What can young poets learn by translating the work of other writers? GC: I started translating out of sheer necessity to learn how to write. You often hear from writers this old piece of advice about re-typing the great works of the masters to let that energy enter your system. Well, I don’t much care for energy, but I have learned technique from doing this. You have this powerful Robinson Jeffers lyric in front of you, and then you have this flabby little joke of a story in Spanish, and you wonder, how are the two related? Little by little, you learn to pay closer attention to the original’s technique and you get to use that in your own writing. Ultimately, translation teaches one how to read and that’s essential to good writing as well. and grey, the color of Juan. We are what we eat: earth, letters, wings, and ash. that give way to another dawn. that sometimes I call sky and others cielo and now céu. and the hermitage fills with overwhelmed flies. (This silence seems poor but took centuries ripening). Olguita sent me a petal in her letter and asked me to check if there are flowers where I live or if the sky is like the one over her house but here I only see snow and the night sky is the same with its stars and its blackness is broader than ever sometimes I lose sight of the moon but I don’t get sad because her petal doesn’t fade and I reread the letter where Olguita wrote life looks so beautiful at our age while I wait to leave this house and return to my own and see the whole flower planted below the narrow sky and the lovely Olguita imagining everything and writing me letters. while in our skin their memory remains. use them up until the world cannot weigh them down. 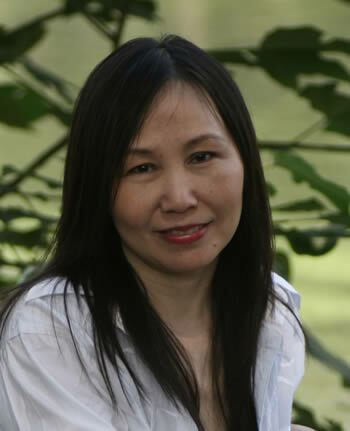 Ming Di (pen name for Mindy Zhang) is a Chinese poet and translator. Born and raised in China, she moved to the US to pursue a graduate degree at Boston University before moving to California. She writes in Chinese and publishes in China and Taiwan. She is the author of six collections in Chinese: D Minor Etudes (poetry), Berlin Story (photo-poems), Days Floating on Footage (poems and essays on movies), Chords Breaking (poetry), Art of Splitting (poetry), and Selected Poems of Ming Di. She has completed four volumes of translation from English to Chinese, including: The Writer as Migrant (2010), Missed Time (2011), and The Book of Things (to be published), and two more in progress. 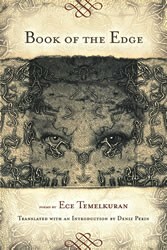 The Book of Cranes, which she co-translated from Chinese into English, will be published by Tupelo Press (USA). She is co-founder and editor of Poetry East West, a Chinese-English bilingual literary magazine published in Los Angeles and Beijing. Masashi Musha: What is the most challenging aspect of translating poetry? Ming Di: The hardest part of translation is to go inside the mind of the poet and find out what he did NOT intend to say. I like to present ambiguities and multiple readings but I also try to avoid misrepresentation. For instance, if the poet hated rhythm and musicality in poetry, making the translation musical would be misleading. Usually one can get it right linguistically in the first few drafts but it takes more time to get the tone right. There are always several choices to translate a line, I would try to bring out the implied, the suggested, the hidden meaning and show the intention, the emotion, the mood. What drives the poem forward (the motif and echoes, the rhythm and variations, the passion or reasoning, the word play, the visual shifting, etc. . . ) should be reflected in the translation. MM: Do you prefer translating poems from English to Chinese or vice versa? MD: Definitely from English to Chinese. I write mostly in Chinese… I didn’t translate poetry into English until I met some of the most interesting poets in China at poetry conferences eight years ago and got to know them better in recent years. I find their work fascinating but they are hardly known outside China. In the past three decades, only the “Obscure” or “Misty” poets and a small number of Post-Misty poets from China have been translated into English, but the newer generation is very different. The new poetry in China speaks more to me. So I started translating Chinese poems and collaborated with American poet Afaa Weaver, but we progressed very slowly. I was highly motivated but there was no such need, until I met some poets from other countries at Struga Poetry Festival in Macedonia— their interest in contemporary Chinese poetry encouraged me greatly. At the present time I translate both ways. MM: Can you describe to us your own process of translation? MD: I try to find out what the poet intends to say at a deeper and more sophisticated level. I imagine where and when the poem was composed, what went through the poet’s mind, who he wanted to speak to, and how he or she was speaking. I put myself into that situation and start working… Revision is important. Reading beyond the poems is also important. I look for reference materials such as interviews and reviews (or biographies) to get to know more about the poets. With the Young Poets Series, I write from personal interaction and observation— each set of poems is accompanied by some write ups, so readers in China would understand them more. MM: Do you like collaborating with others in the process? MD: From Chinese to English, yes, absolutely. From English to Chinese, no. When translating from Chinese into English, I enjoy working with English-speaking poets and explaining the aesthetics and driving force behind the Chinese poems, and they are able to help make my draft into more colloquial English. Communicating is important in the process. I’ve worked with Neil Aitken on more than 100 poems and this is how we revise a poem: I talk and talk and talk, meaning I speak out the line in different ways, until he says “That’s better.” Then he reads and I listen. He reads different versions until I say “That’s it.” There are many ways to render a line, the subtleties of Chinese language and cultural reference embodied in poetry can be explored endlessly. When translating into Chinese, I like to collaborate with the authors. For instance, I’ve asked Jan Wagner, Nikola Madzirov and Sonata Paliulyte to provide literal translation from their languages (German, Macedonian, Lithuanian, respectively) into English word by word, line by line, and explain to me the morphological and syntactical features. I don’t just rely on the English translation, which can be paraphrase. I try to see how they built their poems in their native tongues. MM: And how do you choose which poets or poems to translate? MD: The good ones. The unknown good ones. The not-yet-translated good ones. I used to translate big names, but in recent years I enjoy being the first Chinese translator of young poets such as Marko Pogačar, Valzhyna Mort, Nikola Madzirov, Jan Wagner, Sonata Paliulyte, Ivan Herceg, Tomica Bajsic, Damir Šodan, Ramsey Nasr, etc… about 40 of them. Some I met, some were recommended to me by other poets, some I found in magazines. I don’t care about “fame”, I choose interesting poetry of diverse styles. When I first translated Jan Wagner and Aleš Šteger, I didn’t know they were well known in their countries and in Europe. As to translating Chinese poets into English, I choose currently active poets who are producing real, interesting stuff, different from what’s been introduced elsewhere. Some of them have been translated before but I try to bring out their unusual quality, such as Jiang Hao, Jiang Tao, Hu Hudong, Lü Yue, Lü De’an, Li Li.… Some of them have not been translated ever, such as Lin Zi, Pan Xichen, Jiang Li, Qiu Qixian.… Of course there are other good poets, such as Xiao Kaiyu, Xi Chuan, Han Bo, Xi Yabing, Sun Lei, Lan Lan, Zheng Xiaoqiong, but other translators have been working on them. Which poems to translate? The decision may take extensive reading. For instance, before I started compiling and translating the Book of Cranes, I read the author’s seven published books and two unpublished books. I chose the ones from different time periods to show the evolving stages of the poetic development. With Missed Time that was published in Taiwan last year, I selected eighty poems from the author’s three poetry books. The selection was based on how well the poems represent the author’s overall aesthetics. I also worked with the authors during the selection and translation process. If I translate an entire book, then there is no question of selection, just the entire book. But for the majority of poets that I only translated a few poems of, the criterion is which poems would sound interesting and fresh in the target language. I like unusual imagery and expressions. MM: There have been many political movements in modern China, such as the Cultural Revolution and others. Have any of these events affected your writing in any way? MD: The Cultural Revolution (1966-1976) affected my growing up and coming of age. The 1989 incident influenced my writing tremendously. Other movements affected me indirectly such as the “anti-rightist” movement (1957-1958) as my mother and my sister were deeply traumatized by it. The war and 1949 were brought up by my grandma constantly as she couldn’t get it over. I had a collection of my grandfather’s old photos that spoke to me like nightmare— I only met him by his grave. My sister didn’t speak Chinese when she was brought back to China at age five, but she joined the Red Guard against my father who she saw as an enemy… Political tragedies impacted me from very early on, but how to turn emotion into power in poetry is hard— I didn’t have the strength to do so until I reached middle age— I grew very slowly and matured very late in writing. I don’t like my early writing and I don’t like other Chinese poets’ early writing either— emotional outburst is good only when it’s combined with craftsmanship. In recent years I’ve tried to look beyond the political events and look more into myself and into ancient history and mythologies— modern history is too distant for me to grasp the true meaning and too close to get the true essence either. China is only one spot on the world map. 1989 is only one year in the human calendar, even though it’s the most tragic year in our upbringing. There is so much more to write about, endless. But yes, deep inside me I have been drawn back to 1989 again and again. But I try to resist it. There is something larger than history. I resist the term “1989 Generation” even though everyone writing today in China belongs to it: some were already mature poets in 1989 but still affected by it (such as the Misty poets in China), some were college or graduate students in 1989 (such as me), some were born in 1989 without knowing much of it (such as the youngest poets in China today). I resist the convenient term because poetry is beyond any boundaries, names, schools, labels, especially politically related terms. The more political we are, the more complicated our poetry should be— political background brings another dimension to poetry, it gives an underlying power, an enigma, a bridge to something else, it is anything but limiting. If you ask, that’s how political movements in China “affected” my writing— it made me see the weakness in my writing and it made me want to write something more meaningful. In fact, I resent political poetry unless it’s transparent to other issues in human life. MM: Has the translation process affected how you write your own poetry? MD: Not really, but maybe subconsciously. When I first started, I translated Emily Dickinson, Edna St. Vincent Millay, Moore, Bishop, Ruth Stone, etc., etc. They influenced me as a poet in a way but not directly in my writing. I resist influence from women writers, no matter how great they are. There is a masculine force in my feminine blood that wants to give voice. I think I have been more influenced by Thomas Hardy and D. H. Lawrence, the sensitivity and vulnerability inside them influenced me as much as that in T.S. Eliot and W.H. Auden. It’s the subtle female power inside male writers that attracts me and influences me. Chinese poet and critic Zang Di says: “It’s the woman inside a man who reads poetry, and it’s another woman inside a woman who reads poetry.” I agree and disagree. I would say today that it’s the man inside me who writes poetry, it’s the other woman inside me who reads poetry (although I said something different in another interview). When it comes to translation, it’s the woman inside me who reads the original poem and it’s the man inside me who translates it— both forces are at work in translation, they work together in harmony, but they resist each other underneath— the writing tries to resist the influence from the reading. That is to say, if I present my own voice in my translation, then the translation process doesn’t influence my writing. But I hide my personal voice in translation, I try to imitate the author’s voice— male or female. So the translation process does influence my writing. However, poetry writing is not as simple as black or white, male or female. Voices of poetry are as rich and complicated as a full spectrum of colors, full wavelengths of lights, translators navigate in the sea, face the waves and cross them. Translation broadens the view, the vision, the horizon— that’s how it affects my own poetry writing. MM: Can you tell us about your bilingual literary magazine, Poetry East West, and what kind of poems you publish? MD: Poetry East West is a small independent magazine with a focus on cross-translation of poetry from other languages into Chinese and from Chinese into English (and into other languages whenever possible). All editors are poets and translators fully engaged in poetry: Zang Di teaches poetry at Beijing University and has translated Rilke and several contemporary poets; Mai Mang (Huang Yibing) has translated Duo Duo’s poems into English and nominated him for the 2010 Neustadt International Prize for Literature; Yang Xiaobin has translated Tomaž Šalamun and John Ashbery; Neil Aitken has translated many Chinese poets into English; Wang Ao has translated Wallace Stevens and Hart Crane, etc. There are also excellent Chinese poet-translators from different parts of the world contributing regularly, such as Fan Jinghua from Singapore who has translated about twenty poets including Derek Walcott, Adam Zagajewski W. S. Merwin and Paul Muldoon; Chen Li from Taiwan who has translated many poets including Wislawa Szymborska; Yang Lian from London who has translated contemporary British poets; Meng Ming from Paris who has translated French poets from French and Paul Celan from German; and Li Li who has translated Tomas Tranströmer from Swedish. Some wonderful poets from other countries are translating Chinese poetry into their languages such as Rupprecht Mayer (Germany), Rati Saxena and Sudeep Sen (India), Maryam Ala-Amjadi (Iran), Francois Roy (Mexico), Boel Schenlaer (Sweden), Tozan Alkan (Turkey), Anna Lombardo and Annelisa Addolorato (Italy), Damir Šodan and Miroslav Kirin (Croatia), etc. MD: Thank you Masashi for your interest and for your efforts in bringing more voices out to the poetry community.